Product prices and availability are accurate as of 2019-04-17 07:18:33 UTC and are subject to change. Any price and availability information displayed on http://www.amazon.co.uk/ at the time of purchase will apply to the purchase of this product. The picture showed battery is for reference only, not include. You need to purchase separately. BNF means you only need to have your own battery, charger and transmitter, then you could fly it. Our technician had assembled this quadcopter and have tested it and pre-flied. 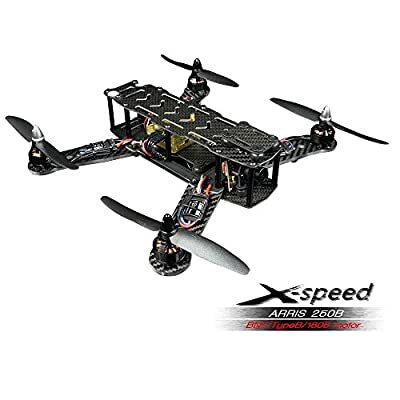 ARRIS X-Speed 250B FPV racing drone comes with high quality ARRIS 1806 brushless motor(New Version), ARRIS Simonk 12A ESC, 5 inches nylon plus 30% carbon fiber propeller, 700TVL HD Digital CCD Video Camera, CC3D flight controller . The motor arm of the ARRIS X-Speed 250B adopts single layer plate structure. The angle of the FPV camera on it is adjustable (0 degree to 15 degree pitch up). The use of vibration damping plate can not only provide you better quality videos, decrease the damage to the frame during crash but also prolong the service life of the electronic parts. ARRIS X-Speed 250B adopts ultrahigh copper pure PCB board, grealy reduce all kinds of wiring mess. ARRIS X-Speed 250B comes with a high brightness LED, and color can be changed through the DIP switches. 7 color for you to choose.